Leaders say until about 10.30 am, no one was able to utter a peep because of the close fight the Congress was putting up. But thereafter, normal service resumed. For the BJP, Monday began on a nervous note. As initial trends of the Gujarat assembly elections started pouring in, the party’s representatives on various channels toned down their volume, seeing how it was shaping up to be a close contest with the Congress. However, as the party started regaining the upper hand, the voices grew louder and shriller. By 11 am, the BJP had touched the 100-seat mark, and the early nerves gave way to the now-familiar confidence. However, the confidence did not get a chance to turn into arrogance, for it was clear the party would fall well short of the target of 150 seats its president, Amit Shah, had set. As a senior organisational leader put it, “10.30 tak to aawaaz hi nahin nikal rahi thi (no one was able to utter a peep till 10.30am)”. Finally, when the party’s trend numbers touched 106, workers began chanting Prime Minister Narendra Modi’s name and bursting crackers. Asked why the celebrations had started so late, spokesperson Sambit Patra said the BJP did not believing in celebrating a victory in advance, and would only do so when the Election Commission put its stamp on the final tally. Senior ministers in the central government had been conspicuous by their absence from the headquarters, leading to repeated messages asking them to be present. They poured in closer to mid-day, with Jitendra Singh, MoS in the Prime Minister’s Office, terming it a ‘historic’ victory. “We did development and the voters reposed faith in us. This is a pro-incumbency verdict by voters of Gujarat,” said Singh. 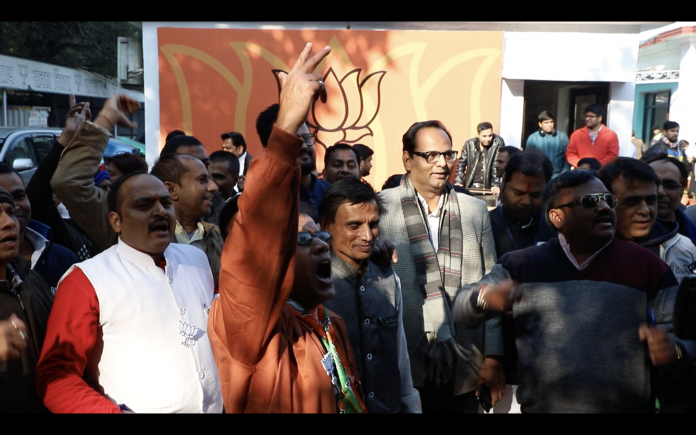 In the demarcated media zone at the party headquarters in New Delhi, other leaders also credited the development the BJP has brought about in its 22 years in power. They said the Congress’s use of caste as a political tool had helped the BJP’s cause, while hastening to offer explanations for the lower margin of victory. “If we get less seats than in previous elections, it will certainly be discussed at length in post-result meetings by party president Amit Shah,” added a senior party leader. On whether Vijay Rupani would continue as chief minister of Gujarat, party leaders toed the line that it was up to the parliamentary board. Sources said there would be an address by the party president post lunch, and that Modi too would attend the parliament board meeting in the evening.